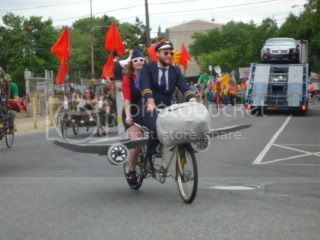 This year I witnessed the annual Kensington Kinetic Sculpture Derby held on Saturday May 22nd. The goal of the competition is to make the wackiest, most interesting, fun contraption, as opposed to winning a race. 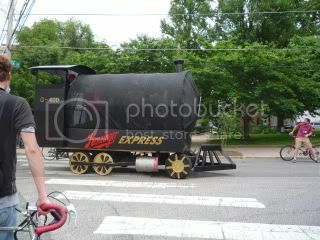 The Derby resembled parade floats on bicycles, with individual riders or group collaborations on an artistic theme. Apparently, Kinetic Sculpture Competitions have been taking place all over the world since 1969. 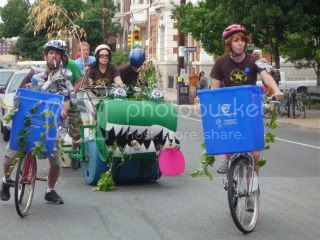 The Kensington Kinetic Sculpture Derby, started in 2007, is a celebration of the creativity and sustainable living that runs rampant in the Kensington and Fishtown area in Philadelphia. While this may sound strange, many traditional American herbalists teach Talking to Plants. I experienced this technique while studying with Susun Weed, author of Healing Wise, taking workshops at the Green Nations Gathering, and while apprenticing with a shaman in Peru. If you can accept the Gaia concept, that the earth is an alive, living being, its easy to tap into the intelligence of Nature. Its a matter of quieting your mind, being observant, and knowing how to ask questions. If the plant has flowers, what colors are they? What chakra or energy center do they relate to? Do the leaves have a particular shape? Do they look like a heart, kidney or lungs? What kind of environment do they grow in? Are they living on distressed land where a delicate plant couldnt survive? Do they seem friendly or look poisonous or threatening? As a trained hypnotherapist, reiki master, and shaman, I have incorporated the therapeutic qualities of plants in my healing sessions. I have been using flower essences as healing helpers since the mid eighties and have had outstanding results. I have found that preparing a remedy for the client to take home accelerates the healing process by supporting changes in old automatic emotional responses and outworn belief systems. The essences can help shift negative personality traits and attitudes into positive ones. Dr. Edward Bach, a British physician, and scientist pioneered the development of the system using thirty-eight flowers in the 1930s. Since then American companies, such as FES have researched and developed new essences using native plants. When you think about it, flowers have always been used to express our emotions. We use them at weddings, celebrations and holidays to express our joy. Sending flowers on Valentines Day sends a message of love. A home-delivered bouquet can express congratulations or an apology. A vase of flowers next to a person in a hospital bed sends a wish to recover. A spray sent to a funeral supports our grief and mourning. Bach discovered that each flower could help a specific emotional or mental condition. What gives them their healing potency is the flowers’ subtle energy. Flowers are picked at the peak of their blossoming and put in glass containers holding distilled water for about three hours while exposed to sunlight. The flowers are then discarded, and the water preserved in brandy. The water’s molecular structure is charged and imprinted with the soul pattern of the flowers’ vibrational essence. It is this plant signature that heals. The essences can enhance ones inner experiences, help release emotional trauma and self-defeating thought patterns and clear up other problems such as indecision, fear, mental exhaustion, hopelessness, and more. They are non-toxic, and non-addictive and can be used with other medications. It is better to take small amounts of a flower essence over a longer period of time for best results as opposed to taking all at once. Four drops, four times a day is an average dosage. Essences are taken under the tongue, in a glass of water or can be rubbed behind your earlobes. On Mothers Day I visited our community garden and found three powerful healers in full bloom. Bleeding Heart can help release co-dependent emotional attachments, and help one re-align to Source. Clematis helps those who space out and daydream too much, become more focused and present. Since time immemorial humanity has recognized and used medicinal plants not just as a source of healing but as a source of inspiration. Mankind inspired by infinite wisdom has discovered the intrinsic interrelationship between man and the environment which is evident in certain cultures which have succeeded in establishing these lines of communication. The sacred teacher plants are living beings which can transmit with their spirits energy and wisdom to other living beings. The existence of the sacred teacher plants is related to life itself and employed correctly inspire wisdom through dreams, visions, revelations, images, perceptions and intuitions. Ancestral Ritual of the Sages. The Shipibo-Conibo performed the ritual Merrayabo tsinquitash rao jihuiqui behuacani” which consists of healing by sacred teacher plants using ancestral knowledge. This ritual was performed in 2006 after 60 years, and the Ancestral Universal School of Shipibo- Conibo Sages from the Peruvian Amazon Chonon Rawa have since seen the necessity of continuing this ritual on a yearly basis. In our times the ritual has become more eloquent due to the call of the plants as a result of their growing extinction and by the the progressive destruction of the Amazonian forest which threatens the continuity of the ancestral wisdom. The presence of all the brothers and sisters of this important ritual with sacred teacher plants will help to send the message from our Mother Earth and our ancestors to the whole world of the need to preserve the natural springs of energy which give life to life and serve to sustain future generations. We have the pleasure to invite you to participate in the Ritual Ceremony  Healing of the sacred teacher plants organised by the Ancestral Universal School of the Shipibo- Conibo sages fo the Peruvian Amazon  Chonon Rawa and the Ecological Reserve community ISA SINA which will take place on the 14th to the 20th August 2010, dedicated to the Sacred teacher plants in the Shipibo ecological reserve community ISA SINA in Ucayali Peru, with the aim of helping to heal our Mother Earth from the degradation of the environment, the pollution and the extinctions of life. For this transcendental event we have chosen the site of extraordinary natural beauty ISA SINA Auwhich is 50 minutes walk from the village of Nueva Betania. After confirmation of booking, the days for arrival to Pucallpa will be 13th and 14th August. If coming by air, you will be welcomed by us at the city airport and transport will be arranged to your hotel. We would be grateful if you could kindly inform us of your date of arrival, flight number and number in your party one month in advance so we can make the reservation in good time as places are limited. – 2pm Reception of the participants in Pucallpa airport with transport to accommodation. – In the afternoon time to purchase any personal items from town if desired. – Welcome greeting song on arrival at the village of Nueva Betania. – 50 minute walk to the ecological reserve ISA SINA. – Greeting to the lake -Lagarto Cocha at the foot of the ecological reserve ISA SINA and bonfire welcome, song and dance. – Purification bath with energising plants of the jungle. – morning purification bathing with energising plants of the jungle. – Thanks and outline fo the Ceremony of the Sacred teacher plants. – Inauguration and opening of the ritual by the president of the Universal Ancestral School of Shipibo- Conibo Sages of the Peruvian Amazon Chonon Rawa. – Song and dance ritual to the Sacred teacher plants Nihue Rao presented by a group of elder maestras of the school. – Rest at the foot of the lake in hammocks. – Ritual of permission for the ceremony with Ayahuasca for equilibrium and harmonization fo the mind, spirit and body of the participants, directed by the Maestro elder Jose who has 80 yrs of experience. – 6:30 dinner and rest. – 9-12:30 pm  ritual to the Sacred teacher plant Renaco directed by Maestros of the School. – 8:30 Ayahuasca Ceremony directed by an elder Maestra of the School. – 9-12:30 pm Ritual to the Sacred teacher plant Catahua directed by Maestros of the School. – 7:30pm Baptism with a Shipibo name to each participant and offering of a present. – 8:30pm Main Ayahuasca ceremony directed by Merraya (Sage) Maestros Chonon Rahua, Soy Bita, Inin Beso with 33 yrs experience. – Farewell and transport to Pucallpa. – 2 days of accommodation in Pucallpa. – River transport Pucallpa  ISASINA  Pucallpa. – 6 days and 5 nights accommodation in ISASINA. To confirm your booking, it will be necessary to pay a 50 percent deposit at least 30 days before arrival in Lima/Pucallpa. Each additional night in ISA SINA if desired would cost S/. 200.00. We await you with much love!